I blame indie nail polish for my lack of money this holiday season. They all really hit it out of the park with their holiday collections. The self control I felt I had most of the year with nail polish, went completely down the drain with indie polish this holiday season. I still have not purchased all of what I wanted, and I'm hoping that they are not limited edition polishes because I'd like to get them at some point. One indie I was really excited about this season was KBShimmer. I saw quite a few polishes in her holiday collection I wanted. I only ended up getting three, when I really could of got them all, but that's how the cookie crumbles. I have Sugar Plum Faerie to show you today. 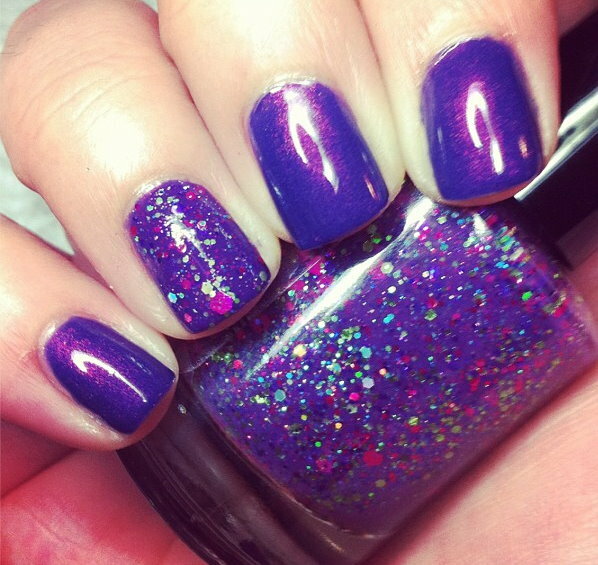 Sugar Plum Faerie is a red-toned purple jelly base mixed with fuchsia, purple, green, and tiny holographic glitters. This is what I think indie polish is all about--creativity. I love when indies create something I never could of thought of myself and really surprise me. This is an entirely unexpected holiday polish with an unexpected mix of glitters and colors that is just perfection. I'm not sure if this was a thought out and planned color or a happy accident.....either way it is amazing. The color combination is beautiful, and on top of that is applies really nicely. I used 3 coats here. The best part of this one is you could wear this year round, it isn't just for the holidays. I am in love -swoon-. Two days in row, but I'm calling this a must have! Oh! I did a mani with this a few days ago, using it as an accent with Cult Nails Flushed. They look amazing together! (Note: I did layer the KBShimmer over the Cult Nails). I purchased this one from KBShimmer's website for $8.75. Oh my gosh - I am in LOVE! This is so stunning. This is gorgeous! I'm hoping to get some KBShimmer for Christmas. It's sort of hard to pick which ones I want because they're all amazing. This is such a gorgeous polish!!!! So glad I have it. I just need to wear it now ;0). Btw, I blame indie polishes for not having money either, haha! This is just beautiful!! I love how it looks with Flushed. Awesome combo! This was on my Christmas wishlist and my MIL bought it for me. I can't wait to wear it. KB Shimmer really hit it out of the park with their holiday collections this year. It looks great with Flushed!